First off, full disclosure; the backpack was given to me by MindShift in return for this review, but that does not mean I’m going to sugar coat this review. I’m here to tell you the good and the bad. Also, the links in this article are affiliate links; if you use them it costs you nothing extra but helps support me. Shoulder and hip straps are well padded. Huge advantage over the f-stop Loka here. Even fully loaded down this pack is incredibly comfortable. Using the belt pack as a day pack: I spent many nights in the backcountry this year, this pack is obviously too small for backpacking, but I still utilized the belt pack for my camera gear. I put everything I needed camera wise into the belt pack and stuffed it inside my backpacking pack. Once we arrived at our camp I could leave everything behind and only bring the belt pack for day hikes, it worked brilliantly! High quality materials; this pack will last a long time. Just like ThinkTank products everything is incredibly well designed, every little feature (and there are lots of them!) works exactly as you would expect. The front pouch (behind the tripod in the picture above) expands a LOT. This is a great place for coats or rain gear. There are tons of attachment points to clip on anything with a carabiner. Weight – the MindShift weighs 5.3lbs vs. the f-stop Loka which weighs 4.65lbs w/ a medium ICU. All the features have to come at a price here, but the added padding and better design make it more comfortable than the Loka. Padded Photo Insert – I feel this could have been designed much better. The spots on the left are too large for a lens alone, they work but it’s a waste of space. Not a huge problem, but I did like the design of f-stops ICU’s better. No user manual – You have to figure out a lot on your own, they have some videos explaining some of the features, but there are a lot more features they could explain better. There are some loops stitched to the back of the pack that I still have no idea what they’re for! Two covers are included; one for the whole pack, and one for the belt pack. The belt pack cover is simple and works well, I’ve had to use it a number of times and my gear was nice and dry. There are many accessories available, I was only sent the tripod suspension kit, so I can only comment on that. As shown in the video the tripod suspension kit is an awesome addition, I’m much more likely to stop and take a shot during a hike because I can access all my gear so quickly. My Oben tripod complements this nicely as it has a built in loop for the clips to attach to. 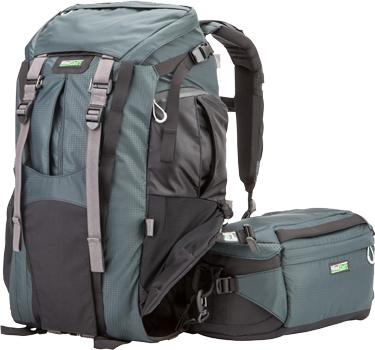 In my opinion there is no better camera pack designed for hiking on the market. I have zero hesitation recommending this pack to anyone! I have sold my Loka and will never look back.